Your Timber and Land Basis: What is it? Why is it important? How is it calculated? A timber or land basis (the actual cost of acquiring a capital asset) may be the most important record for landowners to keep. This publication explains the concept of basis, its use, proper calculation and the need to maintain adequate records for tax reporting purposes. Timber basis is the amount of money invested in the timber itself (excluding the amount in the land on which the timber stands). Your basis is generally your cost plus improvements. In the case of timber basis – cost relates to the purchase, establishment costs or the fair market value of the timber received through inheritance. To calculate basis for previously cut timber, the basis would be a tally of the current owner’s cash outlay to reforest cutover woodland or to plant bare land to trees. If the landowner allowed the land to reforest naturally with no cash outlay, the timber stand has no basis. If the landowner has no record of cash outlays, there is no documented basis. Tax note: You must keep accurate records that document your basis. Your records should show the purchase price, including commissions; any adjustments to basis, such as the cost of improvements like herbicide or prescribed fire. Also reductions in basis need to be documented, these include timber depletion form partial harvests, amortization or casualty and other losses. Generally, all costs associated with the purchase, planting, or seeding of timber are capital expenditures. A capital cost is defined as the money spent to acquire real property or equipment, or to make improvements that increase the value of real property or equipment that is already owned. Capital costs comprise the basis in land, timber and improvements and may be recoverable in the case of reforestation via a tax credit or amortization. Most capital costs are recovered when the asset is sold or otherwise disposed, the exception being reforestation costs. "Capitalization’ is the process of recording capital costs in a land, timber and improvements account so that upon sale or disposition of the property those costs can be recovered. Eligible equipment follows a depreciation schedule whereby capital cost recovery takes place as items are used or worn out. Examples of capital expenditures are those for purchase of land, timber, and buildings, and for machinery and equipment having a useful life of more than 1 year. Capital costs usually cannot be deducted from income in their entirety in the year they are incurred. Instead, they must be used to establish or add to a capital account or basis. At any given time, the dollar value recorded in each account represents the amount of unrecovered capital costs (basis) currently invested in property for the specific land, timber or improvement account. Capitalization is the primary means by which casual investors “handle” costs that are not immediately deductible. A property owner who incurs capital costs as a part of an active business, is entitled to offset or deduct them against income arising from the property-and in some cases against income from other sources. Tax note: The difference between the amount for which you sell the capital asset and your basis, (typically what you paid for it), is a capital gain or a capital loss. You have a capital gain if you sell the asset for more than your basis. You have a capital loss if you sell the asset for less than your basis. This amount of the original basis of the acquired property is most often set by its purchase price or its fair market value for property acquired by inheritance. The original basis may change as capital improvements are made to the asset, or as depletion, amortization, or depreciation are deducted. Basis can be adjusted upward by expenses for capital improvements, while depletion, amortization, and depreciation of costs will decrease one’s basis. An adjusted basis reflects the remaining account balance after a change is made to the original basis. Purchase - If a capital asset is purchased, the original basis is the total cost of acquisition. Purchase is the first entry to be placed in the capital land account and will include all associated costs, including commission, deed tax, surveys,etc. If bare land is acquired, then the timber basis will be the total establishment costs of reforestation or afforestation. Inheritance - The original basis of an inherited asset is its fair market value on the date of the decedent's death or on the alternate valuation date, as reported on the Federal estate tax return, if one is required. An inherited property may also be valued at a special use rate if elected and qualified under the IRC 2032A. The special use valuation will be lower than the fair market value and is often used as an estate planning tool, but restrictions (and penalties) apply. Tax Note: A federal estate tax return may not be required for many estates. In that case, the appraised value as of the date of death (or alternate valuation date, if elected) for state estate tax purposes should be used as the original basis. If neither a federal nor a state return is required, use the fair market value of the property on the date of death. Gift - In most cases, the original basis of an asset received by gift is based on the donor's adjusted basis. For gifts made after 1976, that portion of the gift tax, if any, that applies to the difference between the donor's adjusted basis and the gift's fair market value on the date it is made is added to the donor's adjusted basis to determine the donee's original basis. If the fair market value of a gift when made is less than the donor's basis, then the donee's original basis for loss purposes is the fair market value. For gifts of this type made before 1977, the donee's original basis is the donor's adjusted basis plus the entire amount of gift tax paid, if any, not to exceed the fair market value of the gift when made. Allocation of Original Basis - Sales contracts and other documents transferring forest property often do not list separate prices or values for the land, timber, and other assets when these are acquired together in a single transaction. The total original basis in such situations must then be allocated among the various assets in proportion to the separate fair market value of each on the date of acquisition. Now that you know one of the main benefits of establishing a timber basis, let’s go through the whole process from acquiring a forest property to the disposition of timber with our landowner, Pam. Pam purchased a 54 Acre mostly forested property in Eastern N.C. in December of 2007. The purchase price was $112,000. There were neither buildings nor improvements on the land. A spring 2008 timber cruise revealed 335 cords of pine pulpwood, 125 cords of pine chip & saw and 175 thousand board feet of pine sawtimber volume representing $17.33/ cord, $53.38/cord and $ 272/ MBF in value, respectively. The following chart reflects the timber and land basis for Pam’s tract. (Note the value of the timber reflects average pricing for 4th quarter 2007 from TimberMart South©). Once timber value is established, the remainder of purchase price was allocated to the land capital account. Question 2. How would one handle the allocate basis between land and timber if Pam had hired an appraiser to establish the fair market value of land at the time of acquisition and it was determined that the land was worth $1,500/ acre? Since the value of the timber and land exceeded Pam’s purchase price, her basis must be adjusted downward in proportion to the purchase price. Always keep in mind that the basis can never exceed the acquisition costs of a property. So in this instance where Pam’s timber and land appraisals exceed the purchase price, the timber and land basis is proportionately recalculated from the Fair Market Value estimate. Since Pam acquired a property worth $141,000 for only $112,000 her basis is adjusted downward to reflect her actual acquisition cost. In situations where a landowner acquired a parcel of land yet never documented a basis, an estimate of the volume and value of the timber at the time of acquisition (purchase, inheritance, or purchase by the donor of a gift) must be made. The procedure for arriving at this estimate is called a back cruise, a term for working backward from current value and volume information. However, back cruising is permissible in determining basis only if done while trees are standing. Once trees are cut, tax laws prohibit back cruising. Only timber with a fair market value on the date of acquisition should be included in the basis valuation. If timber basis allocation is made after the acquisition, the present timber volume must appropriated reduced by the amount of growth that occurred since the timber was acquired. Comparable land value ( fair market price at acquisition)can be found in property tax records, consulting forester and realtor records. Timber Price Reports: Timber Mart South and Forest2Market price services are some of the more common reports that will document past stumpage values by date and location. Historic values form these reporting services are available at the Extension Forestry website. Fair Market Valuation- determine separate fair market value of each capital asset then calculate the portion of purchase price that can be apportioned to each asset based on the total purchase price. Other Types of Acquisition - There are nontaxable or partly taxable exchanges that can be used to acquire property. These can result from replacement of involuntarily converted property on which gain is recognized such as that damaged or destroyed by casualty or lost by theft. For a detailed discussion of these types of situations, see IRS Publication 551, Basis of Assets. The loss of standing timber from the hurricanes resulted in major economic losses to owners of timberland. Even though taxpayers may suffer economic timber loss, their deductible casualty tax loss may be quite less or zero. In many instances, where the downed timber is salvaged and sold, there is actually a taxable gain rather than a taxable loss. This information often comes as a shock to timber owners. The extent of their loss is limited to the amount that their records can prove about their cost basis in the timber. or loss on timber is the adjusted basis in the timber. . Since a casualty loss cannot exceed the basis in the timber, owners with no basis or a low basis have little or no casualty loss to deduct. If a casualty completely destroys a timber stand with no opportunity for salvage, the amount of basis minus insurance recovery is the maximum casualty loss that can be claimed. If the insurance recovery exceeds the basis, the taxpayer has a taxable gain instead of a loss. Timber that is damaged but not completely destroyed may often be salvaged. If salvage is not possible, the taxpayer is allowed a partial casualty loss. The owner must determine what percentage of the timber stand has been lost (depleted) and then must multiply that percentage times the timber basis. Insurance reimbursement is applied against this depletion amount, resulting in the final amount of casualty loss or taxable gain. In the case of timber being salvaged after the casualty, the amount received from salvaged timber is treated as a sale, along with insurance proceeds. The total sales amount minus any costs of selling minus part of the basis (the depletion amount) gives the amount of gain or loss. Timber salvaged often results in a taxable gain rather than a casualty loss, not the result a taxpayer is anticipating. Because gains and losses depend on the amount of timber basis individual taxpayers have, the same damage done to adjacent tracts of timber may produce a large casualty loss for one owner, a small loss for another, no loss for another, and a gain for yet another timber owner. Capital gains and deductible capital losses are reported on Form 1040, Schedule D, Capital Gains and Losses, and then transferred to line 13 of Form 1040, U.S. Individual Income Tax Return. Capital gains and losses are classified as long-term or short term. If you hold the asset for more than one year, your capital gain or loss is long-term. If you hold the asset one year or less, your capital gain or loss is short-term. To figure the holding period, begin counting on the day after you received the property and include the day you disposed of the property. property are not deductible. More information about increases and decreases to basis can be found in Publication 551, Basis of Assets. Internal Revenue Service (IRS) requires landowners retain records “sufficient to substantiate your right to claim the deduction” including a map where necessary timber and land acquired, timber cut, and timber and land sold. While filing the Form T- forest activities schedule is optional for most landowners who sell timber infrequently, landowners must maintain adequate records of transactions and other timber –related activities. 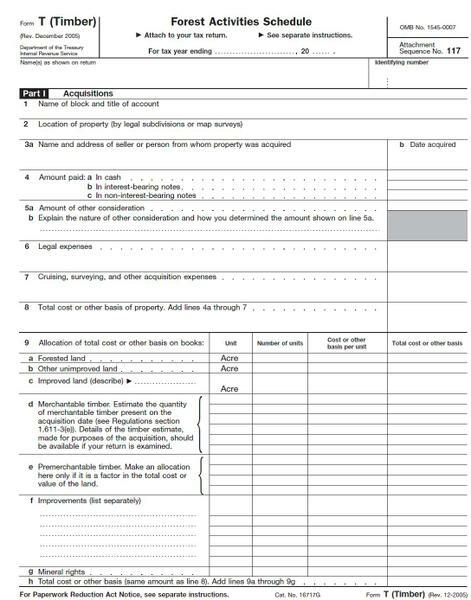 Part l of Form T is a handy means of recording crucial acquisition information for determining timber and land basis regardless of whether a landowner chooses to file this information with the IRS. The IRS suggests keeping separate records for each unique stand identifier, depletion account, block, and tract. They recommend keeping records that verify the basis in property for as long as they are needed to figure the basis of the original or replacement property. Establishing and keeping record of timber and land basis is an important part of any forest landowner’s responsibility for tax reporting. There are substantial tax savings and benefits to be gained from knowing and utilizing a timber basis, especially during timber sales, timber depletions and calculating casualty and other losses. Always seek professional assistance to calculate or verify a land or timber basis, then protect that investment with a system of record keeping that can be updated and passed along to heirs and future buyers. Form T- See item 9 for documenting basis for a new aquisition.